Stronach Stables owned and Adena Springs bred Queen’s Plate winner Shaman Ghost is being inducted to the Canadian Horse Racing Hall of Fame on Wednesday, August 8 at the Mississauga Convention Centre. In celebration, Stronach Stables is donating a 2019 breeding season of the newly minted Hall of Fame member to be auctioned at the Hall of Fame Gala, along with stallion seasons for seven horses standing at Adena Springs North. The son of Ghostzapper, Shaman Ghost was named Canada’s Champion three-year-old in 2015 following wins in the Queen’s Plate and Marine Stakes. His 2016 campaign established Shaman Ghost as one of the best on the continent, winning the Woodward (GR1) at Saratoga, and Brooklyn Invitational (GR2) at Belmont. His career earnings soared to $3.8 million with wins in 2017 including the Santa Anita Handicap (GR1) and the Pimlico Special (GR3). He finished second to Arrogate in the world’s richest race, the $12 million Pegasus World Cup (GR1) at Gulfstream, finishing ahead of California Chrome. 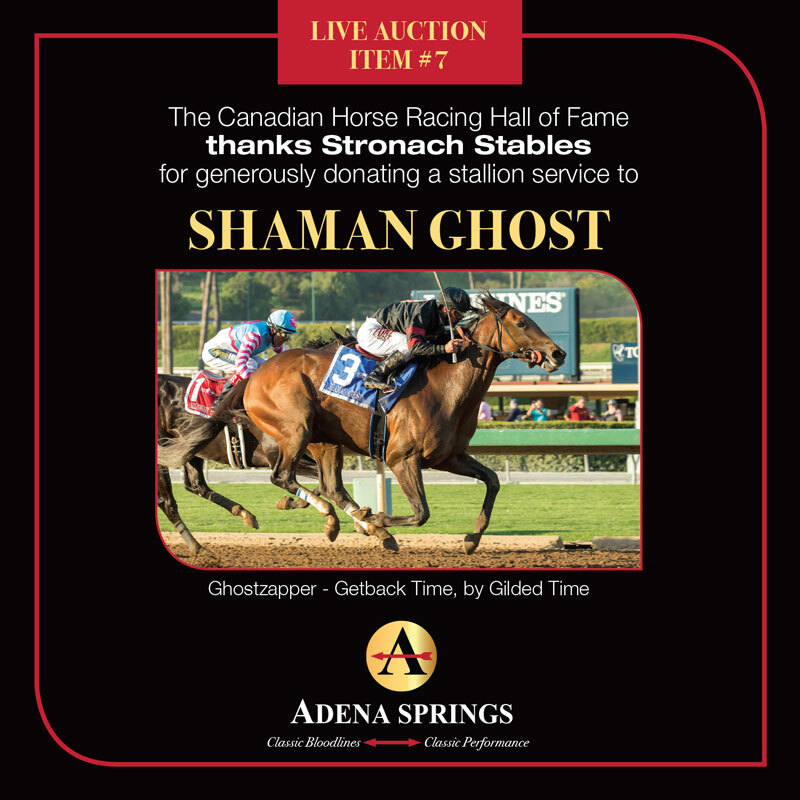 Shamans Ghost will stand at Adena Springs Kentucky Farm for the 2019 breeding season. • Canada’s most accomplished son of three time champion Giant Causeway. • 2018 stakes horses include Lady Angela Stakes winner Fairy Hill. • Unbridled sire-line is responsible for Triple Crown winner American Pharoah, Eclipse Champion Arrogate & KY Derby hero Always Dreaming, etc. Two horses bred by Adena Springs –Breeder’s Cup winner Judy the Beauty and Queen’s Plate winner Shaman Ghost. Ontario-born Thoroughbred breeder, John G. Sikura, operator of one of the most successful breeding farms in Kentucky. Ontario based, Sovereign Award winning trainer Reade Baker, who has also been a jockey’s agent, operated an international bloodstock service and been a successful breeder. Dan Loiselle, the track announcer known for his iconic calls of Canadian Triple Crown races. Bill Andrew, a breeder with ties to Alberta and PEI, who continues to generously give back to the racing industry. Ontario based photographer Dave Landry whose work has been recognized in Canada and internationally. The late Jim Doherty, a gentlemanly trainer-driver from New Brunswick with a career spanning six-decades, much of which took place on US tracks. Blissfull Hall, Quebec-owned winner of North America’s Pacing Triple Crown. Chancey Lady, Ontario-sired, BC owned pacing mare who earned over $2-million. Homage will also be paid to 2018 Legend honourees, Frank McMahon and Hector Clouthier, Sr. The Canadian Horse Racing Hall of Fame acknowledges the generous sponsorship and valued support for the 2018 Induction Gala by the following sponsors: Platinum Sponsor – OLG, Stallion Auction Donor – Stronach Stables/Adena Springs, Video Production Sponsor Woodbine, Audio Visual Supplier FMAV plus Reception and Wine sponsor COSA and Photography Sponsor Omega Alpha. A limited number tickets are still available to attend the event and may be purchased by contacting Linda Rainey 416-417-9404 or linda.rainey@horseracinghalloffame.com.